LIVERPOOL HAVE ANNOUNCED they will compensate supporters who bought a 2017-18 replica shirt with Philippe Coutinho’s name and number printed on the back, after a deal was agreed for the Brazilian to join Barcelona. After five years at Anfield, Coutinho is set to join LaLiga leaders Barca on a five-and-a-half-year contract, subject to a medical. 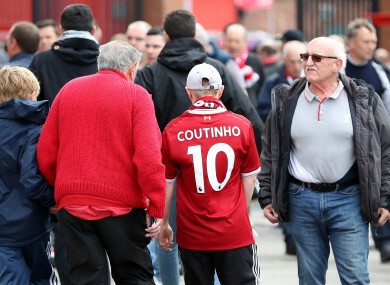 Following confirmation on Saturday that a transfer agreement had been reached, Liverpool issued a statement confirming fans with ‘Coutinho 10′ shirts purchased from the club will be entitled to £50 vouchers. “Liverpool Football Club is to offer supporters who bought a 2017-18 replica shirt printed with Philippe Coutinho’s name and number a £50 voucher, once the move is completed,” read the statement. “The offer – which applies to all shirts purchased in official club outlets and via the official LFC website – follows today’s announcement that Coutinho will join FC Barcelona and reflects the exceptional circumstances behind the player’s departure. “In order to avail of this offer, qualifying supporters should present their 2017-18 Coutinho replica shirt at any official club store where the voucher will be issued. The shirt will not be retained but proof of purchase will be required. Email “Liverpool offer fans compensation on Coutinho shirts”. Feedback on “Liverpool offer fans compensation on Coutinho shirts”.